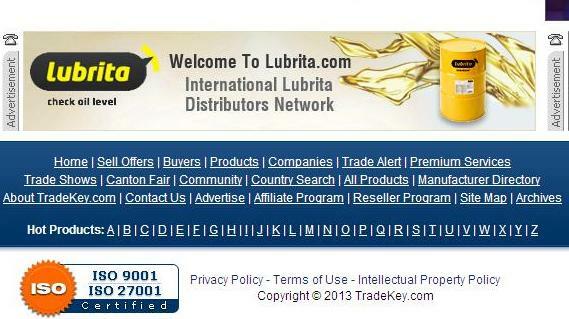 Lubrita lubricants and greases advertisement posted on World's leading B2B marketplace, TradeKey.com. TradeKey brings together information about traders, producers, suppliers, buyers, distributors, trade bodies etc. Presence on the global trade portal front page gives Lubrita International an excellent opportunity to acquire new customers and sales exposure from all over the world. Portal directory front page Lubrita Ad gives for Lubrita International organisation an excellent opportunity to gain new customers and sales exposure in Asia and other important markets.